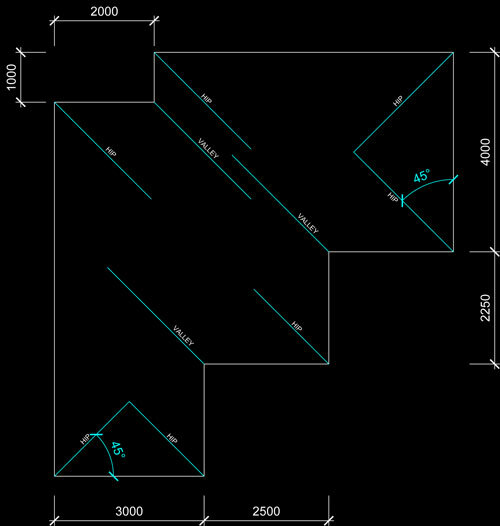 This is a guide on how to draw a hip and valley roof in 2D plan view. 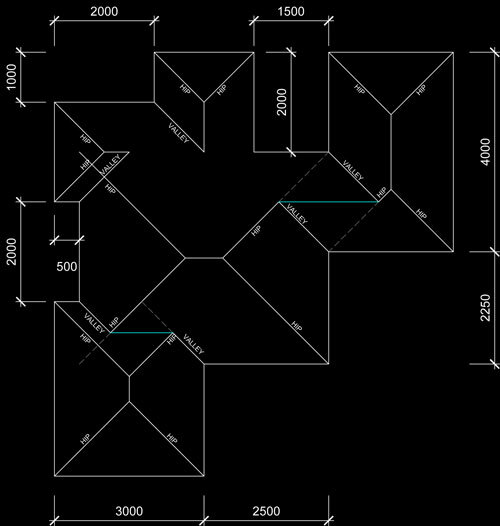 Roofs can become quite complex but hopefully the different ways I show you how to approach the roof design may be helpful. I recommend reading each example to ensure you have read all the information offered as the same information is not repeated in each example. 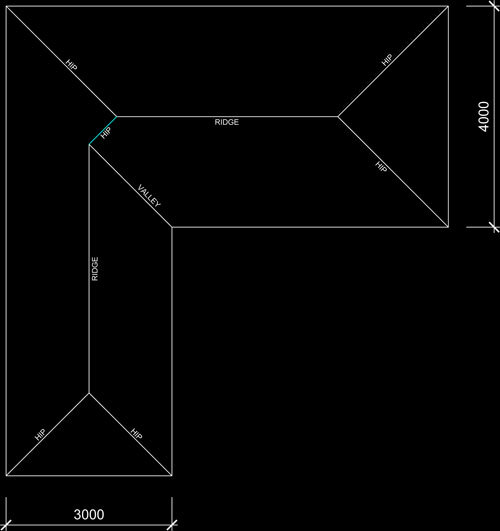 Click on the examples below to view the tutorial on how to draw that roof design. As you can see, this is a floor plan layout of a house. Note the 2 different widths of the walls. 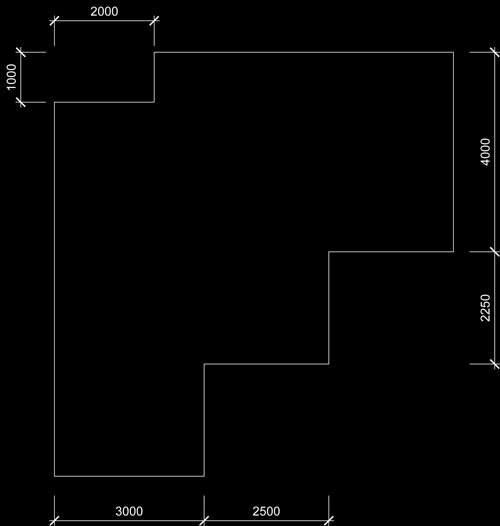 One wall is 4000mm (4 metres) and the other 3000mm (3 metres). These can be any value but I have made them different sizes for this exercise to work as intended. 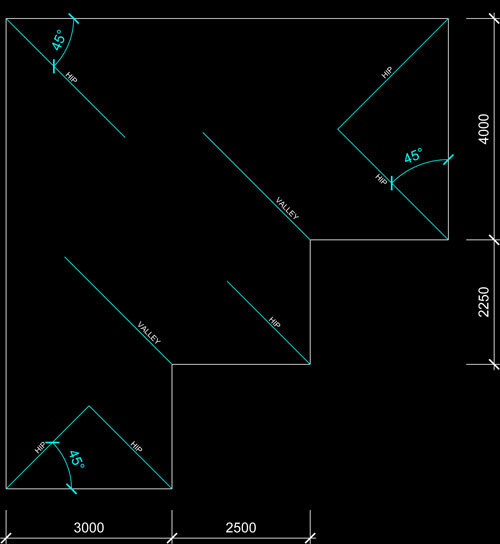 To start drawing in the hipped roof, draw lines at 45 degree angles from all the points on the roof as shown in blue. The internal roof lines are called valleys and the external roof lines are the hips (as shown). As you can see, the 2 lines to the top left of the image are just drawn in approximately. We will determine there length in the next step. All the other lines making up the hips can be calculated by joining them where they intersect. 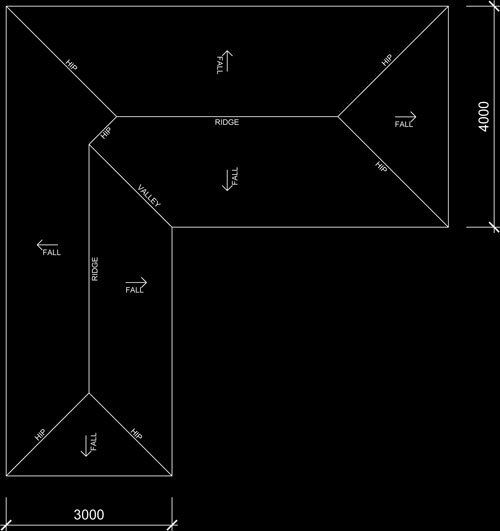 The exact point can be calculated by drawing a point half the width of the wall, across, and up. 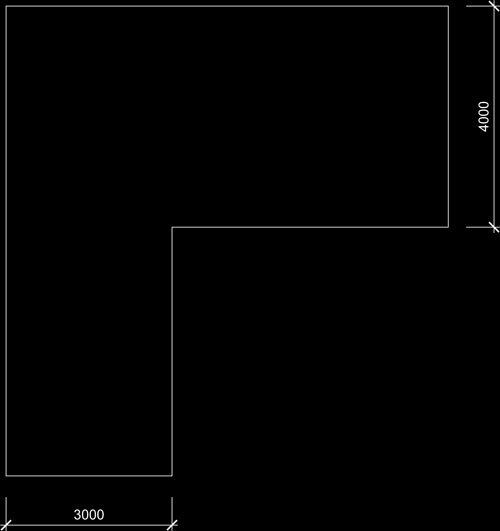 In this example, the wall of 3000mm (3 metres) would have a point 1500mm (1.5 metres) across from the edge of the external wall, and up 1500mm (from that point). 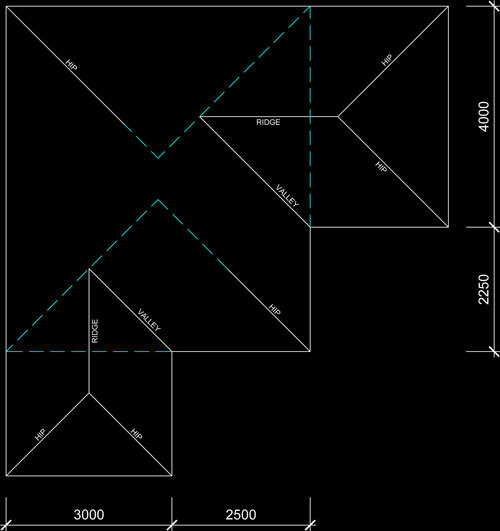 Plan View Fig.003 In this step, we add in the ridge lines starting from where the hips that are established join. We can now trim off the valley line and hip line lengths that were unknown from the previous step. 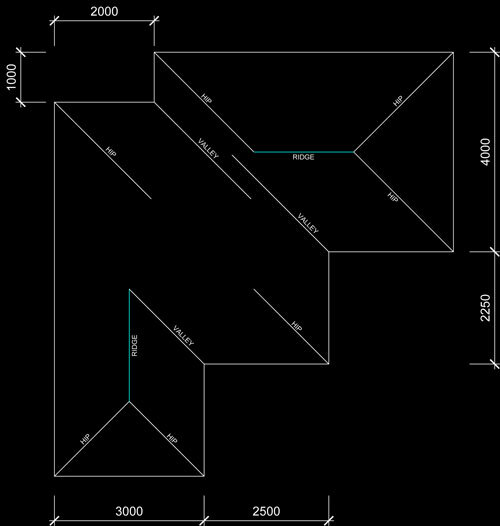 Plan View Fig.004 Now we can draw in the last hip to complete the roof. 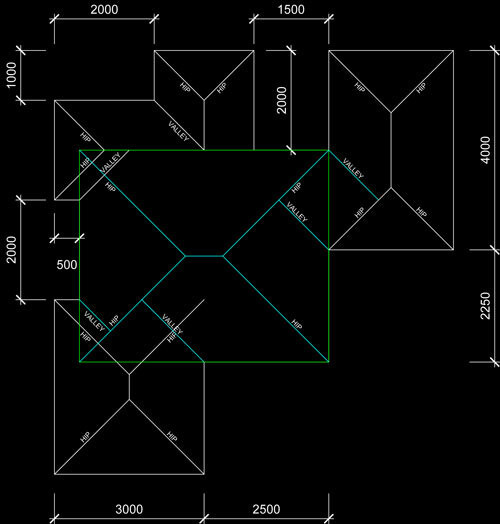 Plan View Fig.005 This is the finished roof showing the fall direction of each of the roof planes. 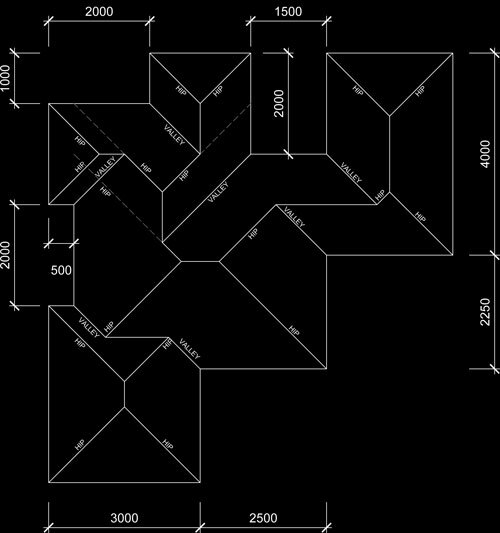 As you can see, this is a floor plan layout of a house based on the previous example layout, but with an extra piece added. 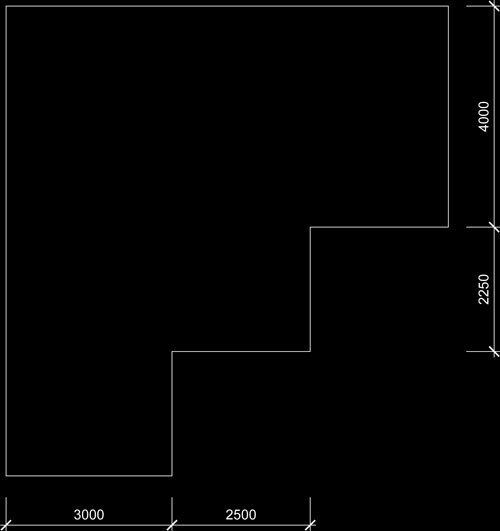 Now we can draw in the ridge lines as shown. In this step, I have drawn in some dashed lines. The 45 degree angle lines represent the hips. 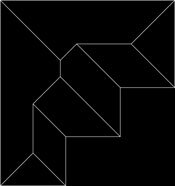 The other 2 lines (the horizontal and vertical line) are there to make an imaginary box. These lines help to show you where to start the hips from. 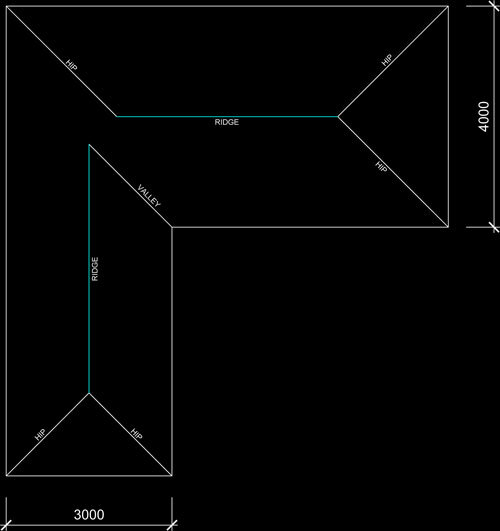 This is a good method for working out roof designs. 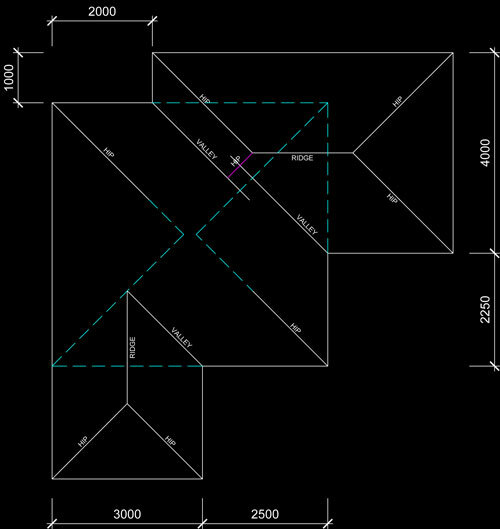 I always try and work out pieces of the roof into rectangles or squares to aid in working out roof line placement. In this step, we can draw in the hip lines and ridge line. Delete the temporary lines we drew in the earlier steps as shown dashed in red. 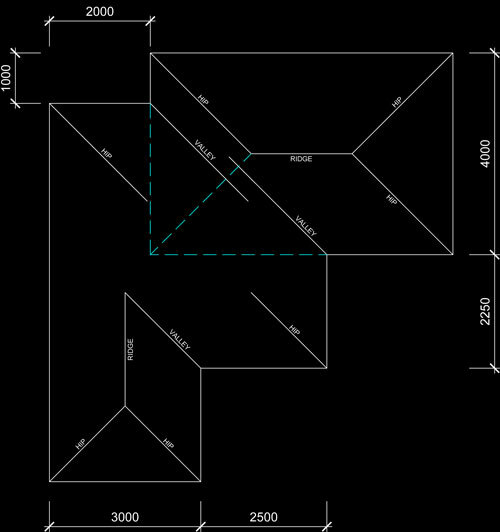 This is the finished roof showing the fall direction of each of the roof planes. 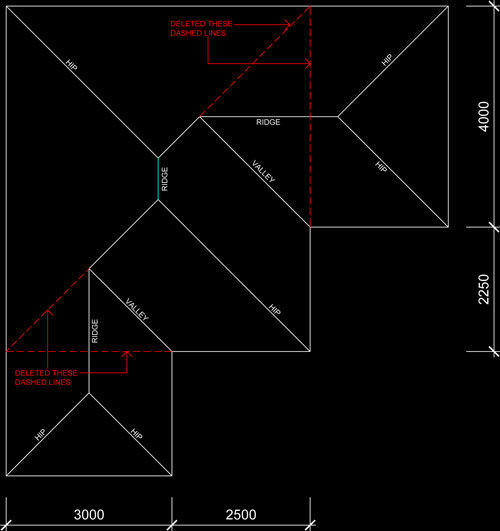 As you can see, this is a floor plan layout of a house based on the previous example layout, but with an extra piece taken out. 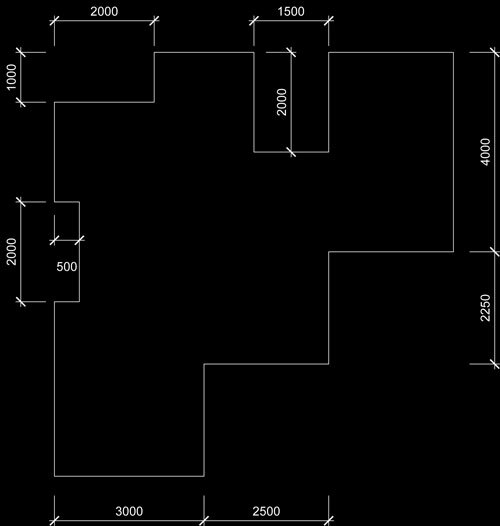 In this step, I have drawn in the hip (purple colour) from the previous steps working out, and also deleted the temporary dashed lines from the previous step. 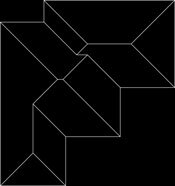 In this step, we have again drawn in the temporary lines of the hips and the vertica and horzontal lines for the imaginary box. In this step, the hip lines have been drawn in and the temporary lines shown in red can be deleted. Now just draw in the ridge lines. 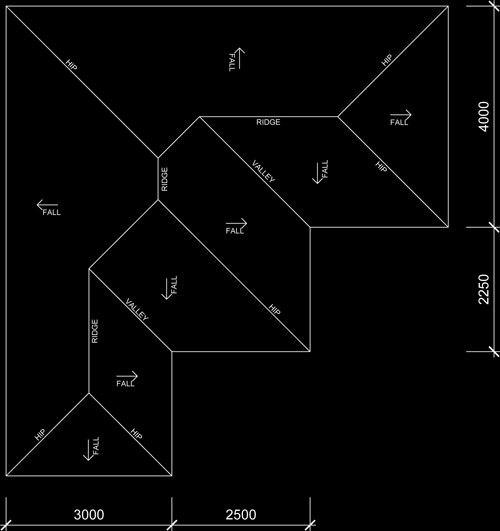 As you can see, this is a floor plan layout of a house based on the previous example layout, but with an extra pieces taken out. 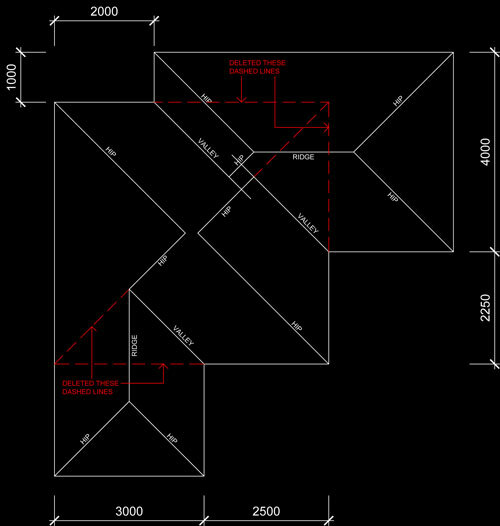 This time we are going to approach the roof design a little differently. 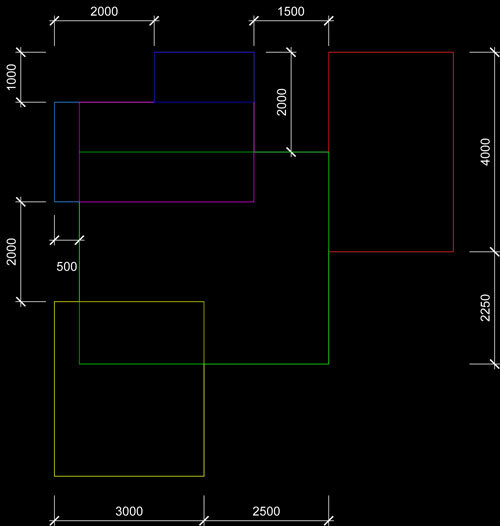 I have created a series of coloured rectangles. 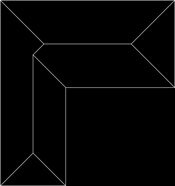 Imagine each rectangle as its own seperate roof. 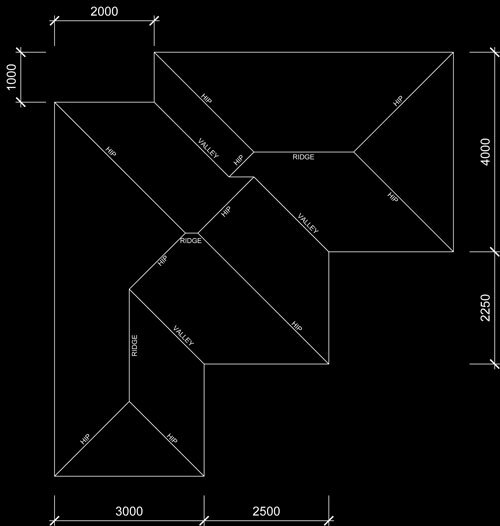 This is how we are going to work out the roof, in pieces, that we will then join together. 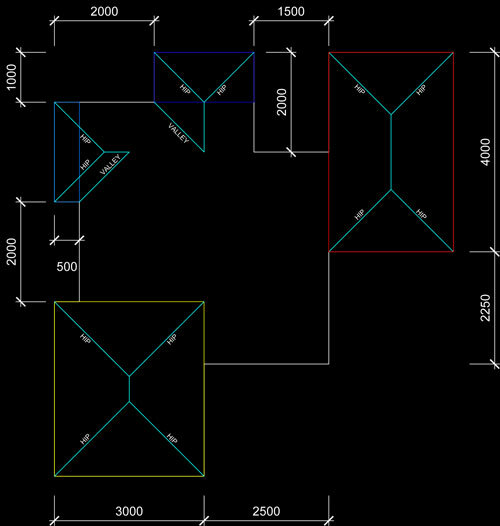 Here I have started creating hip roofs from 4 of the coloured rectangles. Now lets tackle the biggest rectangle, the green one. In this step I have added the hips and also valleys. 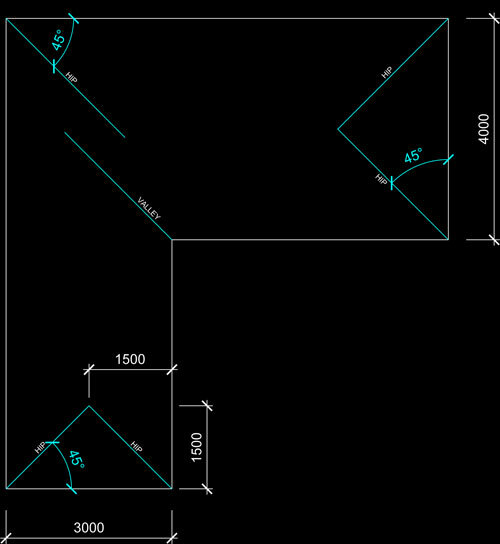 In the next step, we will merge the roof lines together. 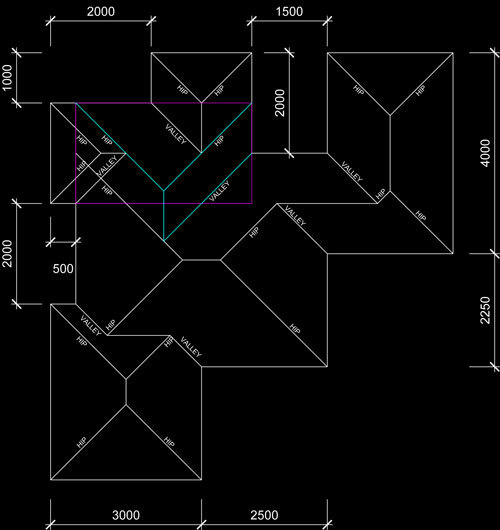 Some parts that are shown now that intersect wil need to be erased to form the proper roof line. In this step, the dashed grey lines are to be erased. 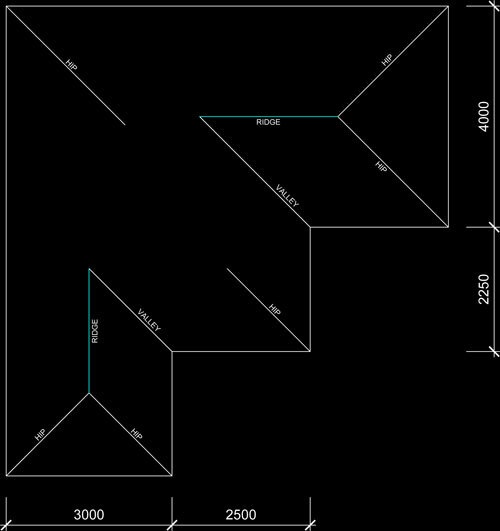 The blue lines are the connecting pieces to merge the different roofs together. 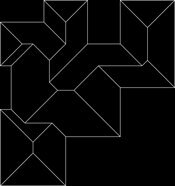 Now we will work on the last rectangle. Add the hips and valley as shown. Erase the grey dashed lines.